Born in Siam , now known as Thailand. The ancient capital of this kingdom was located in Sukhothai by the year (1238-1408). Fighting permanently to their neighbour kingdoms Burma and Cambodia, the country was forced to develop the skills of its soldiers in handling spears, swords, and using the body as a weapon in combat situations. Techniques like kicking, beating with fists, knees, shins, elbows and some ways to bring down the enemy were developed at the time. 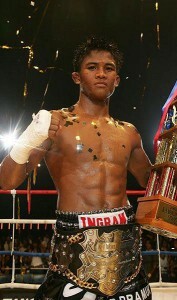 During this period the Muay Thai art was considered an essential part of the Royal Curriculum to aspire to the throne. During the following centuries, the art continued evolving but it was not until the reign of King Narai (1604-1690), characterized as a time of peace, when it became a professional sport. The fights were made in a limited space where a rope on the floor drew a square to indicate the combat area. The rules were simple : fight until the last man stand, or one of the two surrender. There were no limitations in terms of weight, height or age, villages competed against each other and bets were made. In 1774, Angwa, the King of Burma, wanted to hold a celebration for the great pagoda of Rangoon. 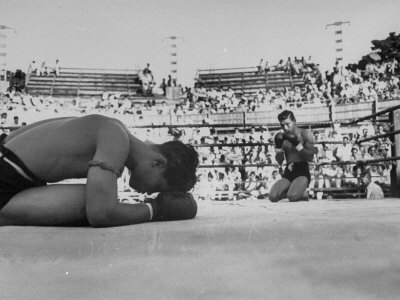 This celebration included boxing and thai boxers were captured to face burmese boxers. In March 17 of that year, Nhai Khanom Tom, a prisoner of war captured by the enemy army fought and defeated 10 King Angwa boxers without any rest between fights. It was the first time that Muay Thai was used in a competition outside of Thailand. For this achievement, Nai Khanom Tom was honored with the title of “Father of Muay Thai” or “Creator of Muay Thai” and March 17 is known today as “Day of Muay Thai”. 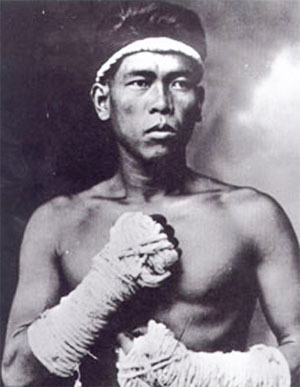 Muay Boran, translated as ” Ancestral Boxing “ is the predecessor of Muay Thai. Its age makes it very difficult to trace through history. 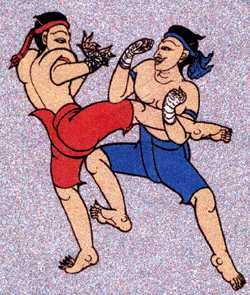 Archeological evidences suggests that a martial art similar to Muay Boran has been practiced in Southeast Asian countries for about 2,000 years. The creation and training in this art was developed for military purposes. The fights that used this style became very popular, and it was called Dhoi Muay, a term now used for boxing in general. Muay Boran was divided into Muay ThaSao (North), Muay Korat (Eastern and Northeast), Muay Lopburi (Central Region), and Muay Chaiya (South). There is a Thai phrase that says ” Korat Punch, Lopburi ability, Chaiya Stand plus Fast Thasao”. 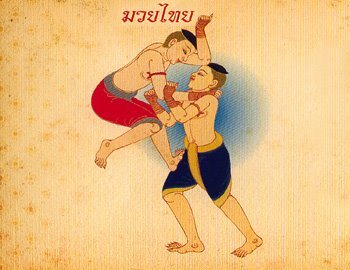 The specialty of Muay Korat is strength. There is a technique called “Beaten Buffalo Punch”. It was named like this because it could defeat a buffalo with one punch. In Korat highlights lessons from Grand Master Khruu Sa. The focus of Muay Lopburi are smart moves. Its strong point is the Straight Punch and Back Fist. The technique of Muay Chaiya is the defensive posture, it´s difficult to take a punch. Great work on Muay Chaiya´s elbows and knees.